Red is flooding mapped from Copernicus Sentinel 1 SAR data provided by the European Space Agency. Blue is a reference normal water extent. Light gray is all previously mapped flooding. For SAR-based mapping, a change detection method is used (GIS file names show comparison image dates). In some cases, "false positive" new water areas are included outside of the floodplains in these maps and files. Red is flooding mapped from Copernicus Sentinel 1 SAR data provided by the European Space Agency. Blue is a reference normal water extent (SWBD. . Light gray is all previously mapped flooding. 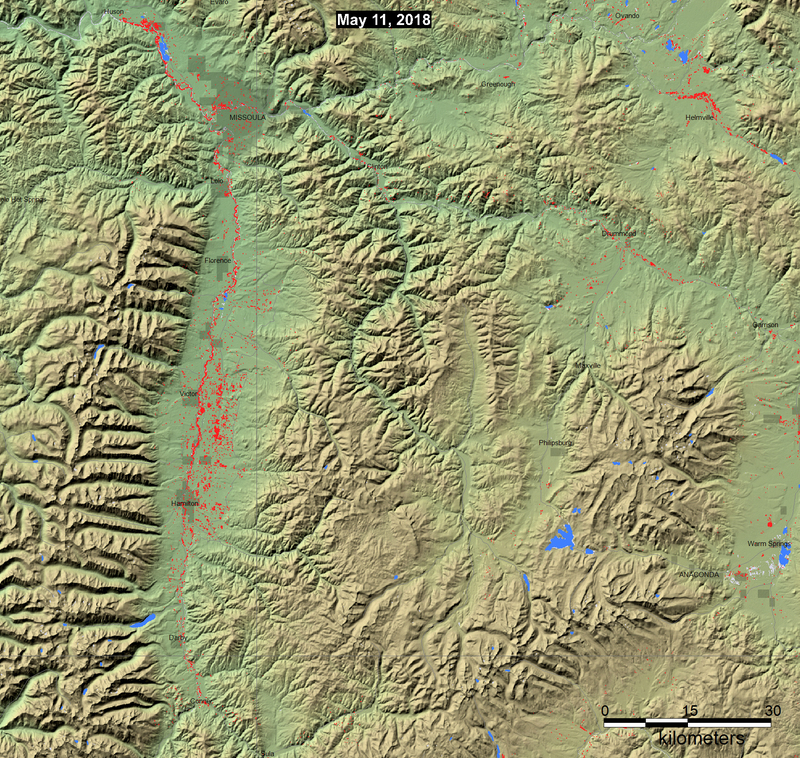 For this SAR-based mapping, a change detection method is used (GIS file names show comparison image dates). Top: Coeur d'alene River, false color composite using data from September 27, 2017 (before) and May 15, 2018 (during). The 10 m resolution of the SAR image has been somewhat degraded by application of a 5x5 low pass filter, to reduce speckle. A band ratio and flood image intensity algorithm is used to identify new water, already visble in the SAR image itself as red colors. In some cases, severe or damaging floods become the focus of Observatory flood extent mapping. As part of collaborations with other organizations, including GEO and the Global Flood Partnership, the Observatory's maps and other data are made available here to the public. With attribution, they can be used for non-commercial purposes. With permission, they can be used for commercial purposes. Consult the Creative Commons license shown below and contact Robert.Brakenridge or Albert.Kettner (at Colorado.edu) if questions. Geotif versions and GIS files are also provided. According to (for Canada/British Columbia) Flood List: "Thousands of people have evacuated their homes in British Columbia, Canada, after major flooding in the province that began on Thursday, 10 May 2018. British Columbia Premier John Horgan said, "The spring flood season is upon us. Heavy rainfall, warm weather and rapid snowmelt have triggered flood warnings and evacuations in the Interior. More than 4,000 British Columbians have been forced from their homes, while thousands more anxiously wait to see what rising flood waters will mean for their homes and their livelihoods." Evacuation orders affecting over 2,700 people were issued in parts of Kootenay Boundary, from Christina Lake through the West Boundary, including areas of Grand Forks. Firefighters rescued around 30 people by boat in Grand Forks, located at the confluence of the Granby River and Kettle River and one of the hardest hit areas.."
NASA Landsat 8 and Copernicus/ESA Sentinel SAR data if used in this map were obtained from the the U.S. Geological Survey Hazards Data Distribution System. and the Sentinels Science Data hub, respectively. Landsat 8 is jointly managed by NASA and the United States Geological Survey. Copernicus is supported by the European Commission.. When used in the maps, Copernicus Emergency Management Service GIS data are imported and installed in the GIS data folder labeled "Copernicus". Delineation" files refer to flood inundation extents. Dissemination Policy: Under Copernicus and Commission Delegated Regulations, the information produced by the Copernicus Emergency Management Service shall be made available to the public on a full, open and free-of-charge basis. Attribution of the source is required "Copernicus Emergency Management Service, Directorate Space, Security and Migration, European Commission Joint Research Centre (EC JRC). Accessed date. http://emergency.copernicus.eu/".